This solid wood buffet was designed for American of Martinsville in the 1960s by Merton Gershun. The stamp of the company is still plainly visible inside the top drawer. It is in excellent refinished condition, finished in a lovely custom seafoam teal and topcoated with lacquer for a durable and clean finish. The top of the buffet has been stripped and stained with provincial stain to draw out the rich tones in the wood. The top has also been lacquered for protection and beauty. 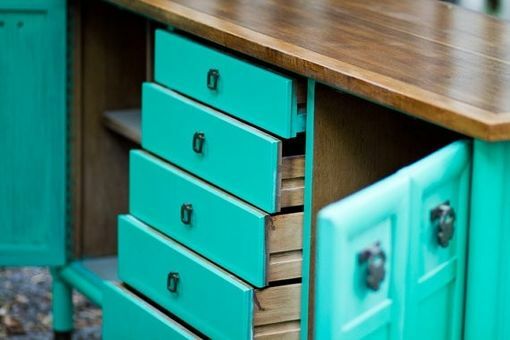 This buffet includes very nice original brass accents on the drawers and legs, which pop against the cool teal. 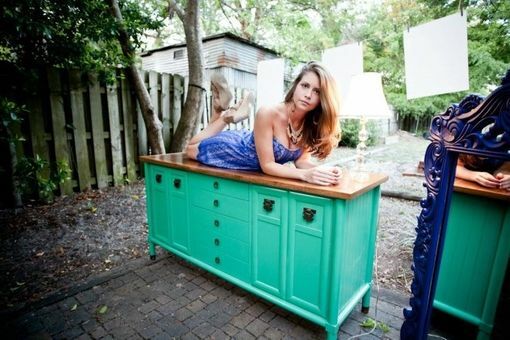 There is tons of storage space, as the sideboard has 5 drawers in the middle and a big compartment on either side. The back of the piece is also teal but it does not have the smooth finish as the front. 64" long by 20.5" deep by 32.5" high.